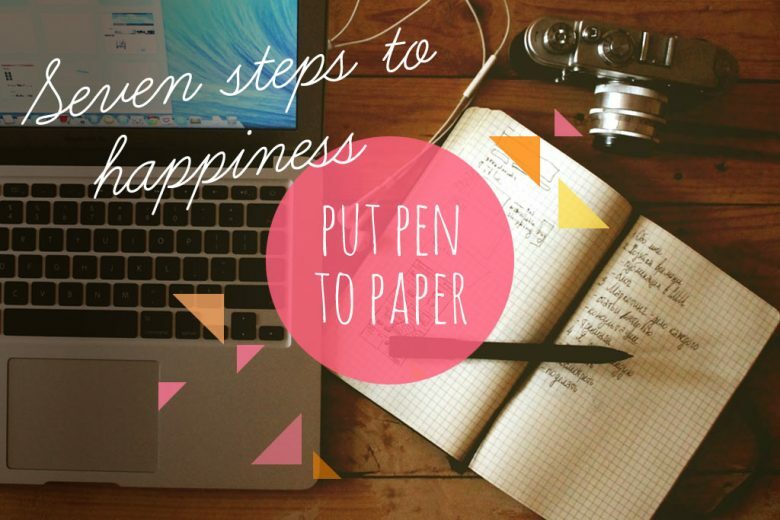 Over the next few weeks, we’ll be continuing our seven steps to happiness. This week, we learn how therapeutic just writing can be when we get in touch with our inner consciousness. Is your mind often turning over worries you can’t solve, or ruminating on the same thoughts over and over again? Katie Phillips from Daring & Mighty teaches us how the simple art of stream of consciousness writing can release unhelpful worries and thoughts, and free to you to live in (and enjoy) the moment. I know that writing may seem a rather intellectual task when the aim is for us to get out of our heads, but trust me – ‘stream of consciousness’ writing is all about release, and it comes straight from your heart. For me, the great thing about this kind of writing is the outflow of information. Rather than letting thoughts run round and round in your head, you are releasing them. And it’s an incredibly liberating feeling. The point of stream of consciousness writing is not to examine or analyse your thoughts. There’s not meant to be any point to your writing. No subject matter. No deadline. No-one will read it – not even you if you don’t want to. The idea is simply to allow every single thought and feeling that is locked in your head to flow out onto paper. It’s an extremely creative exercise – one that takes you out of your left brain and ego, and back into your spirit and heart. It’s a way to reconnect with the real you and how you are truly feeling, without judgement or analysis. For most people, the best time of day to practice this exercise is first thing in the morning. So set your alarm 30 minutes early, and before you do anything else at all, sit down to write. Take some deep breaths into your stomach and mentally connect with your true seIf. Create an intention to get in touch with your spirit – give it permission to take over from your intellect. And when you feel connected, start writing. I find pen and paper works best, but type if that suits you better. If you are so locked in your head that you literally can’t put pen to paper because you don’t know where to start, then allow your intellect to get you going. Choose a topic – say, your plans for the day or what you watched on TV last night or what a friend said to you recently that bothered you. Or ask yourself how you’re feeling about certain areas of your life – such as career, money, friends, family, kids etc. Write for as long as you can – at least three pages. It doesn’t matter if you have typos or your handwriting is illegible. Just scrawl away. If I am mad I will do a big scribble on the page and swear – a lot! It feels great to express every single thing that is going on in my head. It doesn’t need to make sense. It needs no reason. It is pure, uninhibited, unadulterated emotion and it is completely harmless. Brilliant! I find that when I write like this I come to all sorts of deeper understandings about myself, and decisions that felt hard before become simple. New ideas and projects are born, and things that no longer work for me are identified and let go. I feel so liberated and unburdened. So if you’re feeling weighed down by worries, or persistent thoughts you can’t dislodge from your head, set your alarm tomorrow morning and let them all go paper – and enjoy feeling lighter, more refreshed and clearer for the rest of the day. Join us next Sunday when we get all touchy feely in our pursuit of happiness! You can also read last week’s advice – how to get physical here.